Clear Quartz is the ‘Higher Mind Enlightenment Stone’. It amplifies the higher vibrations, making it easier to feel connected to your spiritual aspects, thus allowing you to perceive your life from the Higher Mind perspective. It can be used for amplification of spiritually beneficial patterns in order to override stuck karmic overlays. Because it is neutral, Quartz can be programed by its wearer to radiate any desired mental beneficial frequency. As a ‘Master Healer’ stone it can be used for internal and external healing of any situation or condition because it brings the wearer into the most perfect state of balance possible at the time. Connected to the energies of the Sun and the Moon simultaneously, Quartz balances the electric/masculine and magnetic/feminine within you. It is a powerful amplifier of the magic/beneficial unknown. It relates the physical world to the Higher Mind and the Higher Mind to the physical world. Physically Quartz heals the nervous system and amplifies the etheric health blueprint releasing any disease. 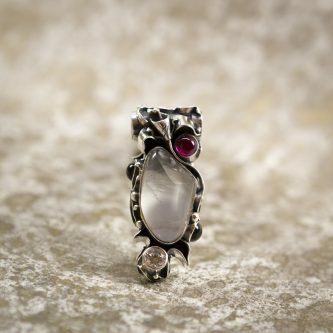 It is a deep clearing stone, brining all energy bodies into the purity of their original design.